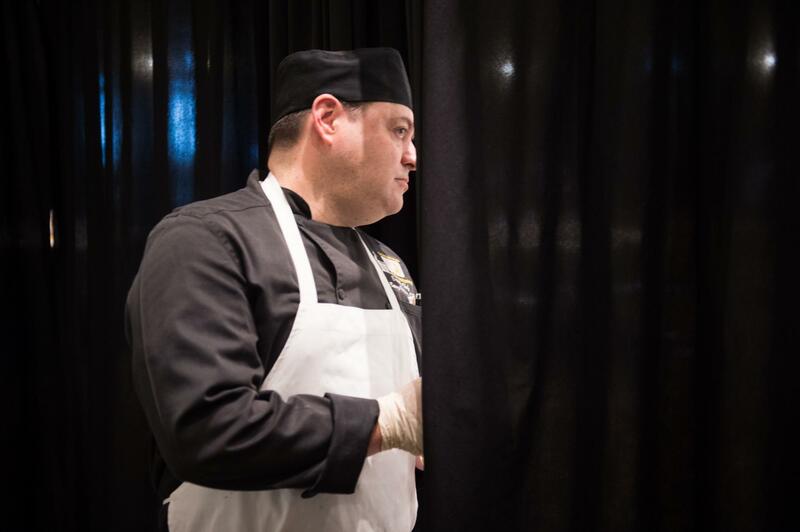 University of Iowa Executive Chef Barry Greenberg racks up wins in local and national competitions while staying true to his goal of serving the highest-quality food possible on campus. Photo by Tim Schoon. In January, thousands of fans in Lyon, France, cheered, chanted, rang cowbells, and blew horns. The boisterous crowd was not there for a soccer match, but instead for the Bocuse d’Or, a biennial culinary competition in which chefs from around the world have 5 hours and 35 minutes to create two elaborate dishes: one meat and one fish. Greenberg is no stranger to culinary competition. In fact, the trip to watch the prestigious event was part of a prize package for being named the Minor’s® 2018 Flavor Expedition Recipe Contest grand prize winner for his recipe, Carnita Tamale Tarts. 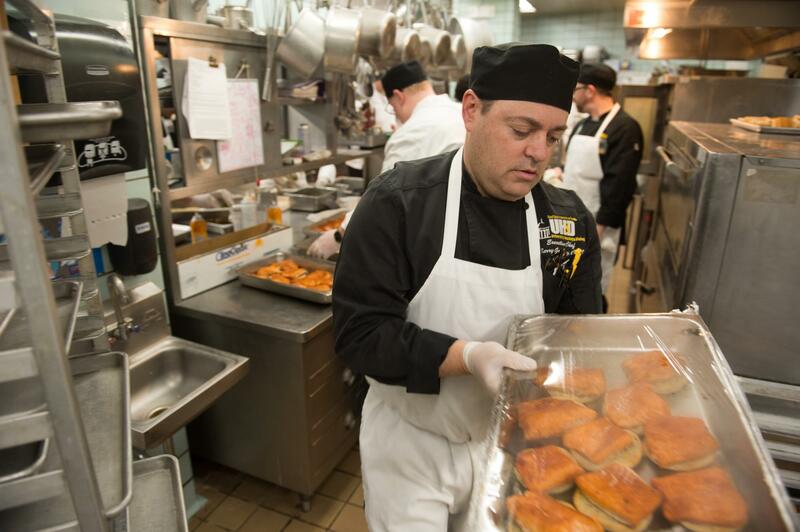 The chef has been honing his skills on the UI campus—where he is responsible for student dining menu oversight and planning, commissary kitchens, campus bakeries, retail dining, and the President’s Residence—since 1992. Greenberg’s culinary career began helping in the kitchen at home and in his aunt’s kitchen on her farm in Vermont, where the Connecticut native spent many of his summers. He worked at a restaurant during high school and earned his culinary arts degree from Johnson and Wales University in Providence, Rhode Island. After graduation, Greenberg traveled and worked ski seasons in Vermont and Vail, Colorado, and summer seasons on Martha’s Vineyard, Massachusetts. 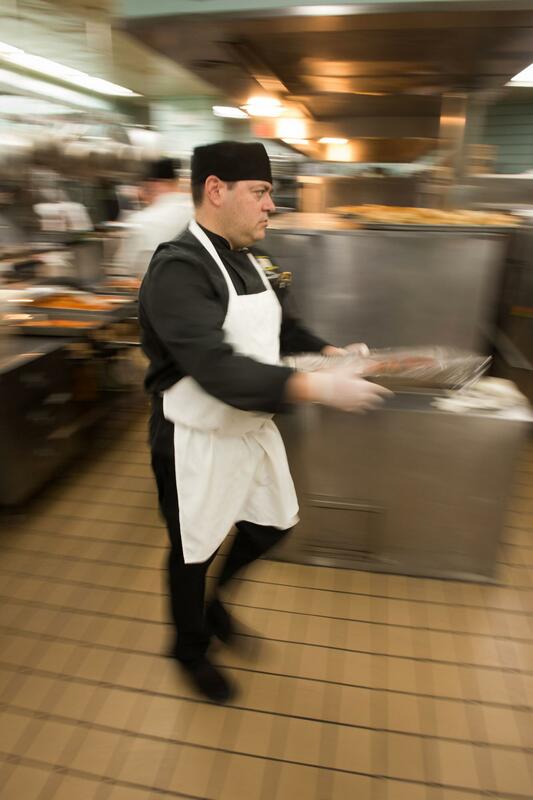 After meeting his wife, he returned to Johnson and Wales University to get his food-service management degree. While there, he took part in a “practice” interview with UI officials who were there recruiting. He was hired and started at the UI in 1992 as an assistant food production manager and became executive chef in 2008. 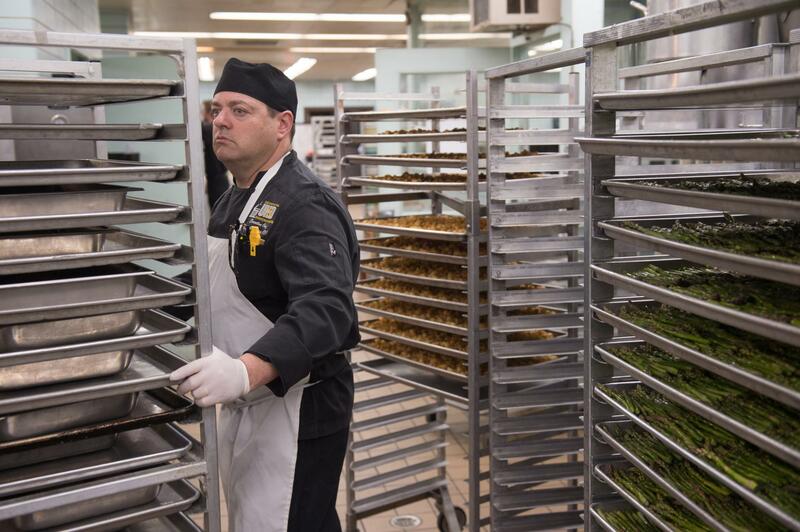 Greenberg says he’s lucky to work with talented, creative chefs who are dedicated to making top-notch food and providing great service across campus. Anne Watson credits Greenberg with encouraging his chefs to challenge themselves, whether through advanced training, competitions, or daily meal planning. Camille Bonar will graduate in May with degrees in English and Spanish and has worked with Greenberg the past two years in the President’s Residence and Catlett Marketplace. The Cedar Rapids, Iowa, native never worked in a kitchen before coming to the UI and says the experience has widened her perspective on food service. Supporting local food producers has long been one of Greenberg’s main goals. University Housing and Dining currently purchases products such as chicken, tofu, maple syrup, and eggs from more than 25 vendors—and counting. Some UI students eat in one of the 18 university dining locations two or three times a day for 32-plus weeks of the year, so Greenberg and his team work hard to make sure they don’t become bored with their options. While dishes such as macaroni and cheese, pizza, and chicken tenders are often available—and loved—Greenberg says he’s always pleasantly surprised when a new recipe or global cuisine proves popular. 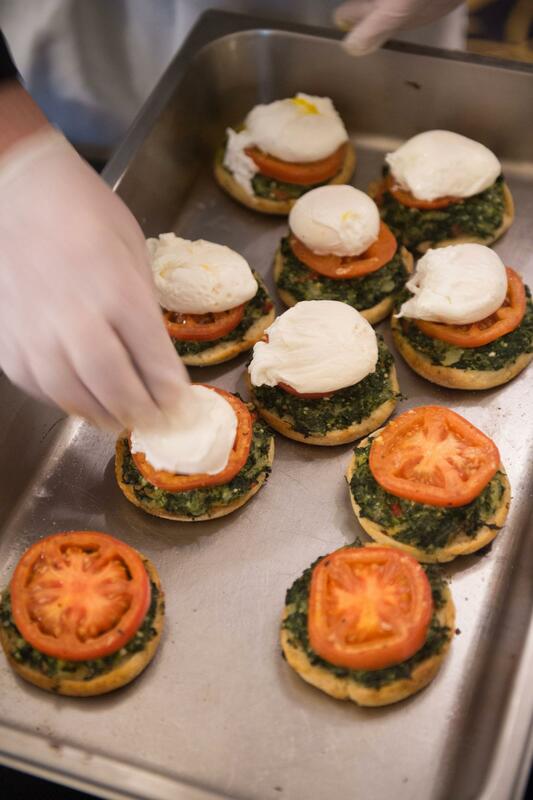 Another way in which Greenberg and his team introduce the campus and wider community to new foods is the popular Lunch with the Chefs. The themed, pop-up lunches, which Greenberg started in 1995, now serve more than 400 people at each of the three annual events. On the menu have been dishes such as beet and kidney bean pie, pierogi, and lentil porridge seafood stew, which Greenberg had a hand in selecting or creating. It’s Greenberg’s skill in developing new recipes that helped him win the trip to France to watch the Bocuse d’Or. Greenberg says he wanted to enter the Minor’s® 2018 Flavor Expedition Recipe Contest for a few years, but the timing was never right until last year. Even so, his recipe for Carnita Tamale Tarts, an interpretation of tamal de cazuela (a type of tamale pie), was born out of a less-than-ideal kitchen situation. He and his family had just moved into a new home and were still unpacking when he developed the recipe. This wasn’t the first success Greenberg has enjoyed success in professional cooking competitions. He also has won American Culinary Federation Gold Medals at the Upper Midwest Restaurant Show and National Association of Colleges and University Food Services Culinary Challenge, as well as top honors at the Cattlemen’s “Best of the Barbecue” competition, twice at the Iowa Pork Producer’s Taste of Elegance, the Avocados of Mexico recipe competition, the Gold Medal Flour Culinary Challenge, and the Maple Leaf Farms Chef’s Challenge. 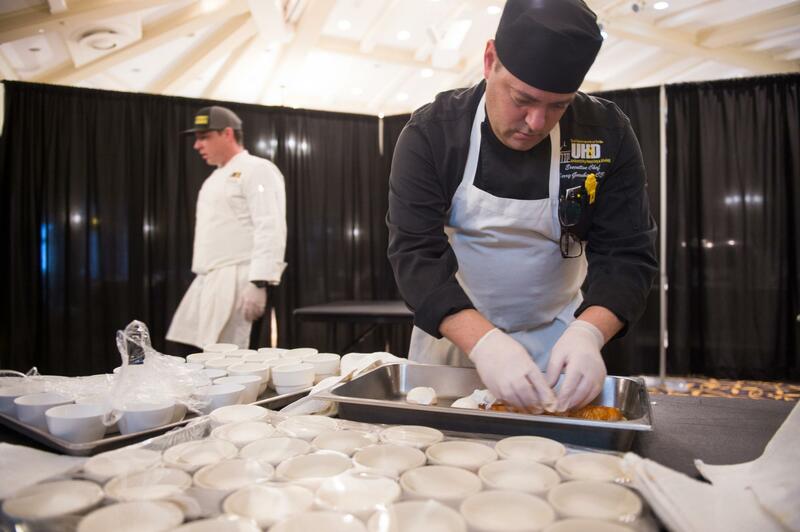 More recently, Greenberg and his team were the judges’ and people’s choice winner in the 2019 Top Chef: Downtown Iowa City—the first time a team has won both prizes in the event’s nine-year history. While some may find it surprising that award-winning chefs are behind the food served on a university campus, Greenberg says it shouldn’t be. Watson agrees, saying she thinks universities historically have gotten a bad rap for the food they serve. 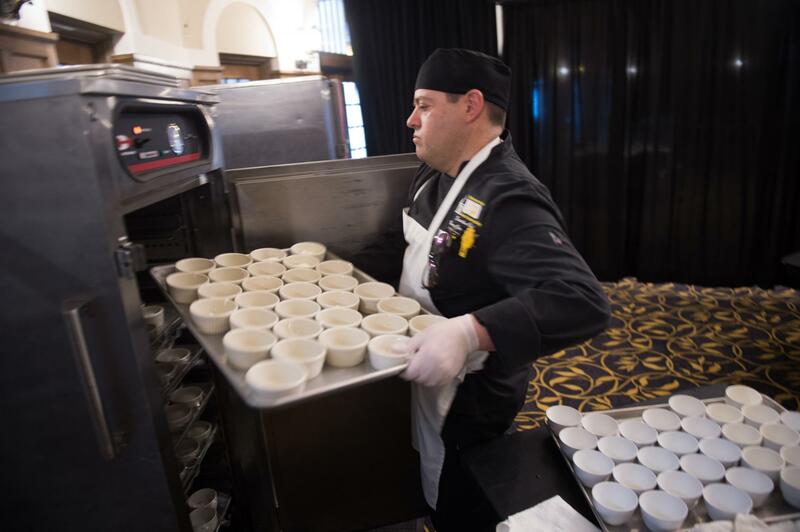 Along with the variety of types of cooking—everything from catered events to the dining halls to a food truck—Greenberg points to the schedule as a benefit to working on a university campus. Greenberg hopes more aspiring chefs realize they can create and serve exceptional meals in settings other than restaurants.